But in a way, I got walked to first base. Let me explain. The weather has been uncharacteristically warm this year. Indeed, it sometimes seems that fall was just too darn stubborn to leave this year. We could rename it a new season. Finter. Maybe Wintall. Anyhow, the warmer weather has produced good fishing on the rivers in many ways, and a much more comfortable environment when flogging the water. The warmth has been giving me delusions of grandeur. Carp grandeur. Last year winter was a robust blanket of snow that kept falling. There was so much snow that the runoff just kept going and going and going. But even with the great amount of snow Jared and I were able to get into fly-carping as early as mid March. That has been on my mind quite a bit, especially with the warmth. I'm getting antsy to make a connection with 20lbs of golden goodness. Jared suggested that we make it a goal to catch the said beast in February. The moment he suggested this it solidified in my mind. Tuesday we were faced with the dilemma. Make the drive for carp that we do not even know will be there, or chase some willing trout with our 3wts. The sun decided for us and we felt almost obligated to try for some gold. We arrived around 1:30pm and the spring-fed area we were planning for looked good. We wadered up, rigged up and set out to sight some fish. Jared waded out while I wandered down the bank for a different angle. Ten minutes later and nada. Not one. Crystal clear blue water, and all we could find were some carp minnow bait balls. We couldn't figure it out. The spring kept the water surrounding it plenty warm for feeding fish. And then we spotted it. This area is a cove that comes off of the main river of the Snake and right were it met the river was a large iced up area. We deduced that this blockage was keeping fish from moving in because it kept the water so cool. We blind casted around the edges of the ice to see if we could find a wandering trout, but it was not to be. As optimistic as we are, it pays to be a realist. Before the trip we had decided on a backup plan to follow if things went south. We drove to another section on the river fed by springs. Walking up stream a bit we felt like we found the end of the rainbow. We had walked up on about 6-7 feeding carp. Here was our chance. Unfortunately we botched it. The circumstances made for tough fishing. Fly eating lava rock bottom, the sun just about to sink below the horizon, heavy flies, and sluggish fish all added to the difficulty and I can't lie, I'm rusty! These fish had their tails up, but were hardly moving. It appeared that they were very slowly sucking things in and out, but we couldn't really get close enough to see. After a few poor attempts by both myself and Jared we realized the visibility just wasn't enough for the tough situation. If we had started there at midday this post may have been very different. Not being willing to give up so easily we decided to use the magic fishing hour to seek out an otherwise wary trout. 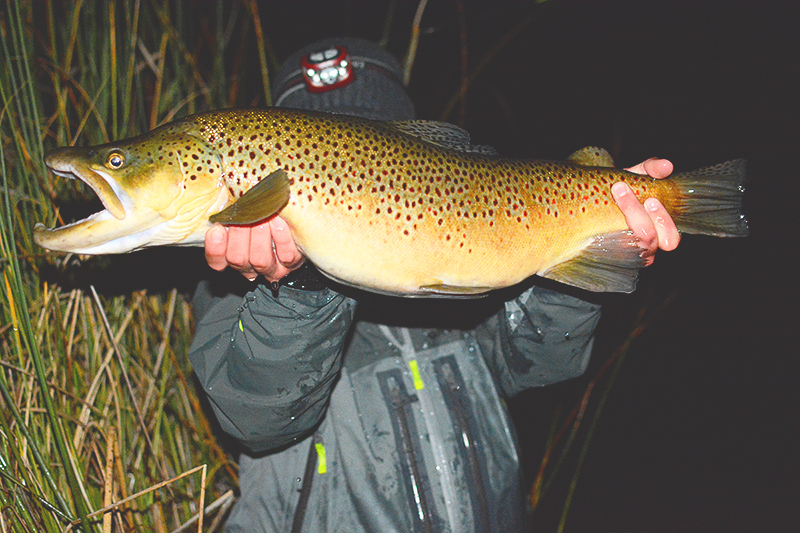 I stuck on a black streamer, walked out to the drop off before the current and lobbed away. On only a few casts in BAM! Fish on. Jared walked down to watch the fight. The fish fought well and I wasn't so sure that I hadn't caught a carp. After a good roll we could identify it as a good trout. Thanks to Jared's netting abilities this beautiful male came to hand. The on-site pictures don't do its size much justice. 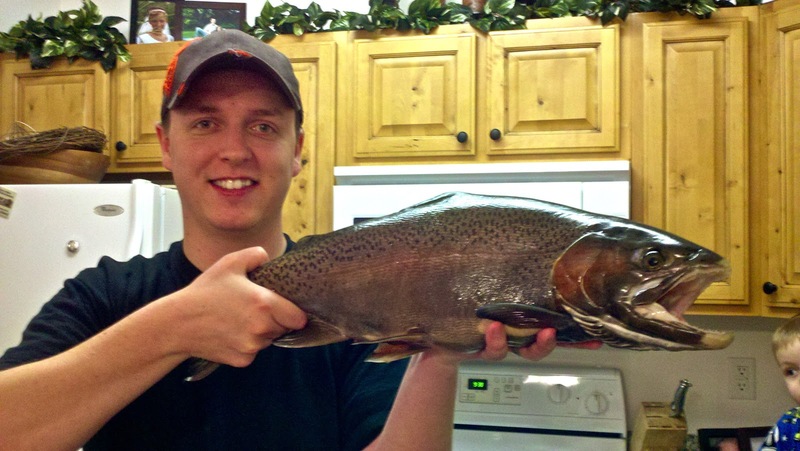 Jared's son loves fish and is glad when his dad can bring some home, so this guy was slated for the dinner plate. One more shot before dinnertime. Strike one for carp, but the month isn't over yet!